Even if you didn’t watch the Oscars, you probably have seen Ellen’s famous “selfie”. 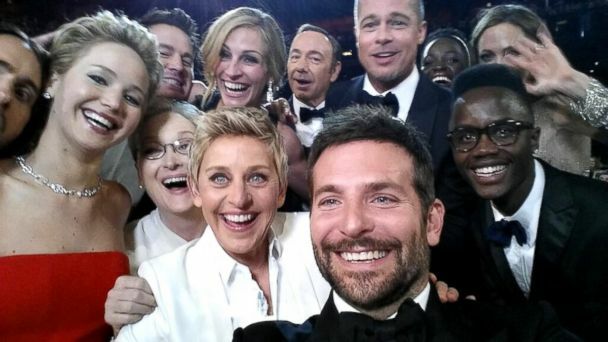 If not, Oscars host Ellen DeGeneres handed her smartphone over to Bradley Cooper so he could take a “selfie” photo of himself and other stars including Brad Pitt, Meryl Streep, Jennifer Lawrence and about a quarter of Jared Leto’s face. Ellen immediately shared the photo via Twitter where it garnered over a million retweets before the end of the Oscars and has now been verified as the “Most Retweeted Tweet” on Twitter with over 3 million retweets as of the writing of this blog. Sharing pertinent and important information from an event in real time has always been a hurdle. For businesses, giving all employees access to the rich and timely discussions that happen at trade shows used to mean waiting for attendees to return to the office and go over the notes they had taken or watching lengthy webcasts from other time zones. Enter the age of the smartphone. Just like Ellen’s selfie, conference attendees can take video with their mobile phone, upload it to the network and share it with other employees who were unable to attend the conference within minutes. Those employees can watch the video on their own time and share videos with coworkers, taking the right information viral across the internal network. All of this is possible through an enterprise video portal. Enterprise video portals provide a centralized location to manage, distribute and share video from any location to anyone at any time. Connecting employees with the information they need at the moment they need it has never been easier. With mobile capture and upload to the enterprise video portal, you can provide authentic and rich content to your coworkers with the push of a button and take enterprise video viral. Most of your videos probably won’t feature Brad Pitt, but you never know who will show up at the next tradeshow! Citrix announced the CSX ecosystem of their Citrix CloudBridge family today. The CSX ecosystem is the next step in “building a strategic networking solution that securely, efficiently and effectively connects the branch to the enterprise cloud network.” Qumu has partnered with Citrix to leverage the power of enterprise video through the CSX ecosystem. Increasingly, businesses are using cloud-based architectures and third-party providers to host a wide range of data in the cloud. While this solution is cost effective and highly scalable, it presents problems when businesses need to deliver large files, such as video, companywide, especially when offices are distributed around the country or the globe. With Qumu’s Citrix-ready, verified VideoNet Edge solution, companies will be able to provide a stellar live and on-demand streaming video experience to all employees by centralizing provisioning and positioning of video and related content. By leveraging the Cloudbridge CSX ecosystem, businesses can minimize bandwidth usage on the corporate WAN and optimize their networks for video delivery. Qumu and Citrix, a partnership that brings video to your communications infrastructure. Learn more about the Qumu and Citrix solution here. We’ve already discussed the impact that mobile devices are having on the enterprise, specifically with regard to video. From smartphones to tablets, business video is beginning to be available anywhere, any time, even on airplanes! That said, mobile video can put a strain on bandwidth. The speed of streaming video from the cloud over a 3G or 4G connection can depend on the signal strength and the number of users trying to play the video. Content distributors must know how the video content is distributed over these networks in order to maximize the efficiency. Using data-heavy transmission methods on slower networks will result in frustration and will eventually shorten the time spent by viewers in watching the video. To tackle this problem, H.264 standard evolved as an attractive solution. H.264 standard, also known as an MPEG-4 Part 10, has the capability to handle high-definition video at a much lower bit rate than previous video codec standards. As a result, overwhelming majority of mobile videos–including YouTube, Vimeo, Google and Apple’s iTunes rentals—started using H.264 standard for streaming. The H.264 standard isn’t the only player in this space, however, the MPEG-4 is extensively used for low resolution and low performing devices. For example, YouTube uses MPEG-4 for low end feature phones that cannot download the higher bit rate. The H.265 standard is considered by some to be the successor for H.264. Also known as High Efficiency Video Coding (HEVC), H.265 aims to improve video quality while doubling the data compression ratio of its predecessor. While this new technology would be more efficient, it will be interesting to see if it can catch on with mobile content providers quickly. Changing codecs is not something that can be achieved over night as there are a lot of legacy devices in use. Video content providers would have to convert all their existing videos to new standards while ensuring that they are compatible with latest versions of various mobile operating systems. Due to this reason, switching to a new codec like the H.265 may be considered a hardware change rather than a software change. Not to mention that H.264 itself is evolving, and today it can handle higher quality, and more complex videos. Migrating to H.265 or some other advanced standard would definitely help ease some costs by decreasing the amount of data consumed by video applications. Having said that, developers and video content providers will need to update older videos to prevent fragmentation in the market. There is no so called ‘catch-all’ kind of solution but the best thing to do is to make advance preparations based on the type of video you publish or produce.